The Forest Owlet is one of the smallest members of the owl family, measuring only about 23 centimeters tall. They weigh approximately 240 grams. They are known by some other names as well including “Forest Spotted Owlet” and “Forest Little Owl”. Their scientific name is Athene blewitti. They were thought to be extinct for more than 100 years but then rediscovered in 1997. This owl species is native to the forests of Central India and is listed as endangered by IUCN. They can be easily distinguished by their square-head with strikingly yellow eyes. 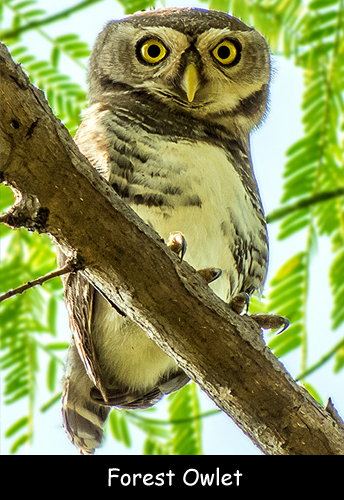 Despite having small bodies, Forest Owlet has big disproportionate talons that help them to catch their prey easily. Forest Owlets generally hunt during the day and feed upon rodents, grasshoppers, lizards, birds, and frogs. They have dark grey-brown plumage and also a faintly spotted crown and mantle. Their breeding season takes place between October and March and incubation period lasts for about 30 days. Females lay their eggs in a hole made in a softwood tree. The main threats to their existence include habitat destruction and deforestation. Male Forest Owlet sometimes kills and consumes its own offspring before they are fully fledged. They use different vocalizations as a means of communication. They hunt while perched on a high tree and they like to store extra food inside tree hollows. Declan, Tobin. " Fun Facts for Kids about Forest Owlet ." Easy Science for Kids, Apr 2019. Web. 18 Apr 2019. < https://easyscienceforkids.com/forest-owlet/ >.